NASHVILLE, Tenn. (AP) — Tom Brady added another big chunk of NFL history to his resume. 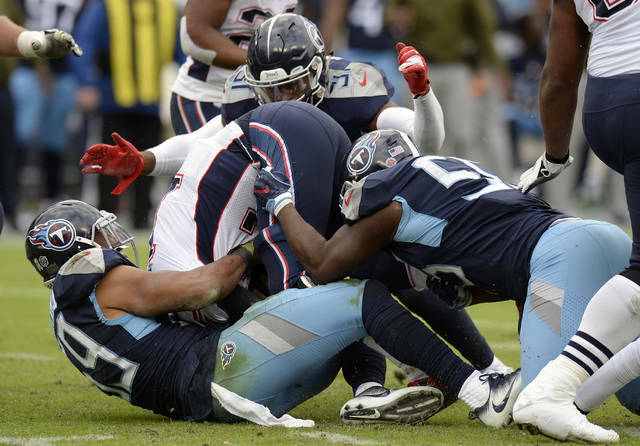 The Tennessee Titans made sure the Patriots quarterback didn’t finish his 300th game by hitting him over and over again. The Titans sacked Brady three times and hit him six more times as they beat New England 34-10 Sunday, snapping a seven-game skid against the Patriots in Mike Vrabel’s first game as head coach against the team he helped win three Super Bowls. It was the most sacks allowed in a game this season by the Patriots (7-3), and coach Bill Belichick pulled Brady for Brian Hoyer midway through the fourth quarter. Asked if he thought Brady was effective, Belichick said to ask Brady. “It was just a bad day for all of us,” Brady said. Only Brett Favre (326) has played in more games, both regular season and postseason, as a quarterback than Brady. The three-time NFL MVP also needed only three touchdown passes to tie Peyton Manning (579) for the NFL record for most TD passes all time for both the regular season and postseason. Brady left having thrown for 254 yards and no TD passes. The Titans outgained the Patriots 385-284, holding New England to just 40 yards rushing. Linebacker Wesley Woodyard, who had 1½ sacks, said that allowed them to get after Brady. Marcus Mariota capped each of the first two drives with TD passes, and Derrick Henry ran for a pair of TDs. Ryan Succop also added two field goals as the Titans (5-4) scored a season high in points after jumping out to a 17-3 lead in the first quarter. They now have beaten both of last season’s Super Bowl teams in Nashville. The loss snaps a six-game winning streak going into New England’s bye. 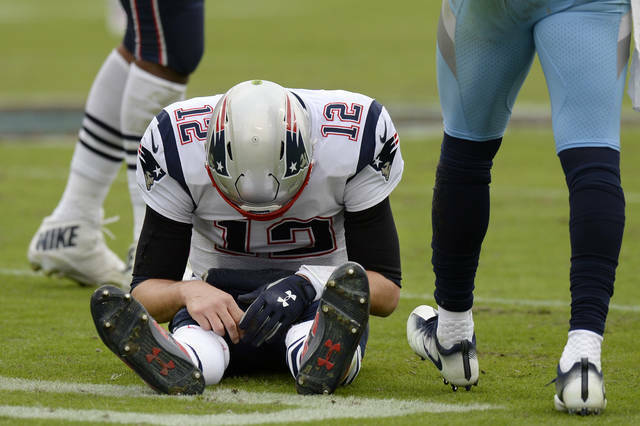 The Patriots, who routed the Titans 35-14 in January, also lost to Tennessee for the first time since Dec. 16, 2002. Darius Jennings opened the game with a 58-yard kickoff return, and Mariota capped the drive with a 4-yard TD pass to Jonnu Smith. The Titans never trailed again. The Titans came in with the NFL’s stingiest scoring defense and also leading the league in fewest touchdowns allowed in the red zone. They held the Patriots to a pair of 52-yard field-goal attempts by Stephen Gostkowski, who missed his second wide left. James Develin scored on a 1-yard TD run early in the second, which pulled New England within 17-10. Brady looked ready to pull off another amazing comeback, driving the Pats to the Titans 37. The Titans stopped Brady a yard shy of the first down after catching a pass from Julian Edelman. A false start followed, then Logan Ryan, a former New England cornerback, broke up a Brady pass to Edelman to turn the ball over. On the very next play, Vrabel called his own trick play with Jennings throwing to a wide-open Mariota for a 21-yard gain. Hoyer replaced Brady on the next drive. 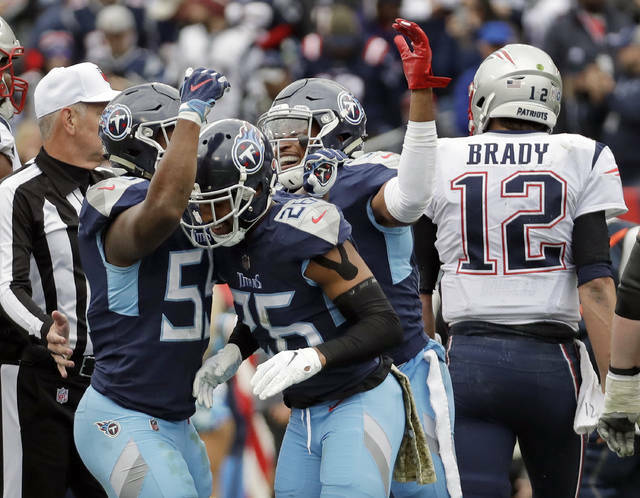 Tennessee fired coach Mike Mularkey after the January playoff loss and hired Vrabel to try to recreate the Patriots’ winning ways with the Titans. Vrabel hired Dean Pees, a former Patriots linebackers coach and defensive coordinator, as his defensive coordinator. General manager Jon Robinson, who started in New England, signed cornerback Malcolm Butler and running back Dion Lewis in free agency. Brady’s catch was just the third of his career and first since Dec. 6, 2015, when he caught a 36-yarder from Danny Amendola against Philadelphia. At 41, Brady became the oldest player with a catch since Jerry Rice had 30 at the age of 42. Brady slipped at the end and said he didn’t know what happened. “It was ‘fish out of water,’” Brady said. Patriots left tackle Trent Brown missed the final drive of the first half and was announced as questionable to return because of illness. LaAdrian Waddle replaced him for that series, but Brown returned for the first start of the third quarter. Brown left later in the third quarter with an injured back. Edelman hurt an ankle and didn’t return. Tight end Dwayne Allen also hurt a knee in the third quarter. Titans running back David Fluellen picked up 16 yards on back-to-back runs, then went down untouched on the next play with a knee injury. Patriots: Bye, then visit Jets on Nov. 25. CINCINNATI (AP) — Drew Brees and the Saints rocked Paul Brown Stadium from the opening drive, scoring every time they got the ball except for the last one. Then they cranked up the music in the locker room until the cinderblock walls were vibrating, too. For New Orleans, it was as much fun as it gets in the NFL. Brees threw three touchdown passes in a blistering first half, moving ahead of Brett Favre for second place on the career list, and New Orleans rolled to its eighth straight victory Sunday, 51-14 over the Cincinnati Bengals. Then they blasted the music. Brees led the Saints to touchdowns on all five first-half possessions with a nearly perfect performance — only two incompletions. His 17-yard TD to Michael Thomas with 2 seconds left in the half gave him 509 career touchdown passes, one more than Favre. Up next: Peyton Manning’s record 539. “If you play long enough, I guess those things happen,” Brees said. “I consider myself very grateful, very blessed. Brees had his way with the Bengals’ historically bad defense , even diving over the pile to score a 1-yard touchdown. Cincinnati (5-4) became the first team in the Super Bowl era to give up 500 yards in three consecutive games; New Orleans finished with 509. The Bengals matched the most lopsided defeat in franchise history and gave up the second-most points in club history. In the first half alone, the Saints piled up 311 yards and had 21 first downs on 40 plays. Brees was 18 of 20 for 214 yards with three touchdowns in the opening half. “I’m kind of in shock after a loss like that,” linebacker Jordan Evans said. In the last four games, the Bengals have given up 481, 551, 576 and 509 yards. They’re on pace to give up the most yards in NFL history. Mark Ingram and Alvin Kamara recognized Dez Bryant by crossing their arms after scoring touchdowns. The former Cowboys receiver signed with the Saints on Wednesday but tore an Achilles tendon in his second practice. “Two days is not a lot of time, and yet there’s a lot of respect,” coach Sean Payton said. The Saints sent the Rams to their first loss last week, 45-35, and kept the momentum with their highest-scoring game of the season. Ingram had 13 rushes for 104 yards, and Kamara scored twice as New Orleans picked up 244 yards on the ground. “Look, this was a good game, but it wasn’t a perfect game,” Payton said. Pretty close. The only time New Orleans failed to score was when it took a knee at the Bengals 31-yard line to end matters. What’s it like playing in an offense like that? Another encouraging sign for the Saints: Their struggling defense held in check a Bengals offense missing A.J. Green, out indefinitely with an injured toe on his right foot. Andy Dalton went 12 of 20 for 153 yards with two interceptions, including one that Marcus Williams returned 78 yards to set up Brees’ third touchdown throw. “We all had a hand in it,” Dalton said. It’s the fourth time the Bengals have lost a game by 37 points in their history. The club record for points allowed was 52 against Carolina in 2002. The 28 points allowed in the second quarter matched the club record. New Orleans had allowed touchdowns on 20 of opponents’ 28 drives inside the 20-yard line, which ranked 28th out of 32 teams in red zone efficiency. The Bengals managed to get inside the 20-yard line only once, on their opening touchdown drive. Brees has an 89 percent completion percentage when targeting Michael Thomas this season. Thomas finished with eight catches for 70 yards and two touchdowns, including a diving 7-yard catch in the end zone. Thomas has 274 catches in 40 career games, surpassing Odell Beckham Jr., who held the mark for most receptions in NFL history through 40 outings. Saints: LT Terron Armstead suffered a shoulder injury in the second quarter. Bengals: CB Dre Kirkpatrick suffered a concussion in the second quarter and didn’t return. Saints: host the Eagles next Sunday (Nov. 18). Bengals: play at Baltimore next Sunday. The beat the Ravens earlier this year. CHICAGO (AP) — Fish oil, vitamin D, novel drugs, new cholesterol guidelines: News from an American Heart Association conference over the weekend reveals a lot about what works and what does not for preventing heart attacks and other problems. Dietary supplements missed the mark, but a prescription-strength fish oil showed promise. A drug not only helped people with diabetes control blood sugar and lose weight, but also lowered their risk of needing hospitalization for heart failure. Good news for everyone: You no longer have to fast before a blood test to check cholesterol. Don’t stop at the doughnut shop on your way to the clinic, but eating something before the test is OK for most folks, the guidelines say. They’re from the Heart Association and the American College of Cardiology and are endorsed by many other doctor groups. No authors had financial ties to drugmakers. Heart disease is the leading cause of death worldwide. High cholesterol leads to hardened arteries that can cause a heart attack or stroke. When guidelines were last revised five years ago, they moved away from just using cholesterol numbers to determine who needs treatment and toward a formula that takes into account age, high blood pressure and other factors to more broadly estimate risk. That was confusing, so the new guidelines blend both approaches, setting targets based on the formula and considering individual circumstances, such as other medical conditions or a family history of early heart disease. “It will never be as simple as a single cholesterol number,” because that doesn’t give a clear picture of risk, said one guideline panel member, Dr. Donald Lloyd-Jones of Northwestern University. If treatment is needed, the first choice remains a statin such as Lipitor or Crestor, which are sold as generics for a dime a day. For people at high risk, such as those who have already had a heart attack, the guidelines suggest adding Zetia, which is also sold as an inexpensive generic, if the statin didn’t lower cholesterol enough. Only if those two medicines don’t help enough should powerful but pricey newer drugs called PCSK9 inhibitors be considered. Many insurers limit coverage of them — Repatha, sold by Amgen, and Praluent, sold by Sanofi and Regeneron — and the guidelines say they’re not cost-effective except for folks at the very highest risk. Finally, if it’s unclear whether someone needs treatment, the guidelines suggest a coronary artery calcium test, which looks for hardening of the arteries, to help decide. It’s a type of X-ray with a radiation dose similar to a mammogram and costs $100 to $300, which most insurers do not cover. Lloyd-Jones and others defended its use. “Half of people will have a zero calcium score and can avoid a statin very safely,” a quarter will score high and need treatment, and the rest will need to weigh options with their doctors, he said. The Cleveland Clinic’s Dr. Steven Nissen, who had no role in the guidelines, called them a big improvement but disagreed with “using a test that involves radiation to decide whether to give a drug that costs $3 a month,” referring to the price of statins. A cheap test to check for artery inflammation would be better, he said. Two major studies gave mixed results on fish oil , or omega-3 fatty acids. There are different types, including EPA and DHA. In a study of 26,000 healthy people, 1 gram a day of an EPA/DHA combo, a dose and type found in many dietary supplements, showed no clear ability to lower the risk of heart problems or cancer. But another study testing 4 grams a day of Amarin Corp.’s Vascepa, which is concentrated EPA, found it slashed heart problems in people at higher risk for them because of high triglycerides, a type of fat in the blood, and other reasons. All were already taking a statin, and there’s concern about the results because Vascepa was compared to mineral oil, which can interfere with statins, and may have made the comparison group fare worse. Still, some doctors said Vascepa’s benefits seemed large enough to outweigh that worry. The study that tested the lower amount of fish oil in the general population also tested vitamin D , one of the most popular supplements, and found it did not lower the risk of cancer or heart problems. “Don’t waste your money on those supplements,” which are not well regulated and are of varying quality, said Dr. Deepak Bhatt of Brigham and Women’s Hospital in Boston. People with diabetes often die of heart disease or heart failure, and new diabetes medicines are required to be tested in large studies to show they don’t raise heart risks. One such medicine, Jardiance, surprised doctors a few years ago by lowering the risk of heart attacks and strokes. A second medicine, Invokana, later showed similar benefits but with some worrisome side effects. A new study tested a third drug, Farxiga, in more than 17,000 diabetics with other heart risk factors and found a lower rate of hospitalization for heart failure or death from heart-related causes — 5 percent among those on the drug versus 6 percent in a placebo group after four years of use. That’s on top of the drug’s known benefits for controlling diabetes. Certain infections and a serious buildup of acids in the blood were more common with Farxiga but these were rare and are known complications of the drug. It costs about $15 a day, about the same as similar medicines. Farxiga’s maker, AstraZeneca, sponsored the study and many study leaders consult for the company. One independent expert, Dr. Eric Peterson, a Duke University cardiologist and one of the conference leaders, said doctors have been eager to know if the earlier studies suggesting these drugs might help hearts were a fluke. Results from the new study, the largest so far, “could make this class of drugs much more standardly used” for diabetics with high heart risks or heart failure, he said. COLUMBUS, Ohio – The Ohio State University President Michael V. Drake was sworn in today as chair of the Board of Directors for the Association of Public and Land-grant Universities (APLU). APLU is the oldest higher education association in North America and comprises 238 institutions, including 74 land-grant universities. Drake is the first Ohio State president to serve as APLU board chair in nearly four decades. Since becoming Ohio State’s 15th president in June 2014, Drake has consistently cited the importance of the university’s land-grant mission while initiating historic access, affordability and excellence measures that have directly supported thousands of students and attracted more academically outstanding and diverse freshman classes each fall. Under Drake’s leadership, the university has established the Ohio State Tuition Guarantee and added more than $100 million in financial aid for low- and moderate-income students. The Buckeye Opportunity Program, for example, ensures that thousands of Ohio students who qualify for Pell Grants receive an aid package that covers at least the full cost of tuition and mandatory fees. The program started on the Columbus campus this fall and will expand to Ohio State’s regional campuses in the spring — benefiting an estimated 4,200 students overall. Most recently, the university eliminated 70 percent of all course fees, discounted digital textbooks, waived costs of certain credit hours for students with heavy academic loads and extended in-state tuition to more military families. This package, beginning in January 2019, builds upon a series of measures implemented at Ohio State since Drake first outlined his vision for the university at his investiture in 2015. Drake completed his year-long term as chair of the Association of American Universities (AAU) Board of Directors on Oct. 23. He now serves as past chair of AAU, an organization of 62 research institutions. APLU board members work to make public institutions of higher education more effective in delivering quality and affordable higher education while advancing cutting-edge research and robust community and economic engagement. The APLU board’s priorities align broadly with Ohio State’s Time and Change strategic plan, developed during Drake’s tenure and announced in August 2017. The university’s long-term vision is focused on access, affordability and excellence and research and creative expression, as well as teaching and learning, academic health care and operational excellence and resource stewardship. And with a nod to Ohio State’s founding purpose to offer an excellent education while elevating society through research, Drake established the President’s Prize in 2016 to have a direct impact in the community. Graduating senior recipients of the prize are awarded up to $100,000 in support of projects with the potential to create meaningful social change. Drake has helped spearhead national efforts to create opportunities for students who face barriers to a college education. He is a founding member of the American Talent Initiative, a consortium of more than 100 institutions seeking to increase enrollment of highly qualified middle- and lower-income students. He also serves on the executive board of the University Innovation Alliance, 11 public research universities working to make degrees more accessible to lower-income and first-generation students. Demand is at an all-time high for an Ohio State education with a record 52,540 applications for the 2018 entering class, and Drake is continuously looking for opportunities to further enhance the educational experience. The University Institute for Teaching and Learning — a first-of-its-kind initiative at Ohio State — opened in the fall of 2016 to establish best practices in the classroom. The institute recently introduced an incentive-based Teaching Support Program, designed to help foster optimal environments for student learning. It is believed to be unique in the nation for implementing a research-based survey instrument on effective teaching practices across the whole institution. A groundbreaking Digital Flagship collaboration with Apple is also focused on transforming teaching and learning, and supporting economic development opportunities. As part of this initiative, Ohio State launched the largest learning technology deployment in university history this year, supplying more than 11,000 new students with iPad Pros. The deployment is one of several student-focused programs, including the popular President’s Affordability Grant program, funded through administrative efficiencies. In 2015, Drake announced a plan to generate $200 million in efficiencies across the university over five years as well as an additional $200 million in innovative funding. Ohio State is on track to meet its efficiencies goal — and has far surpassed its innovative funding target with $1.1 billion generated thus far. That number includes upfront funding from the university’s Comprehensive Energy Management partnership, the largest-ever single investment in Ohio State’s academic mission. Launched in July 2017, the partnership is also focused on improving energy efficiency on the Columbus campus by 25 percent. With all-time highs in retention and graduation rates, records for academic excellence and diversity as well as fundraising, and the academic medical center’s nationally recognized reputation for quality, safety and innovation, Ohio State is one of the preeminent land-grant institutions in the nation. In a first for the university, Ohio State’s Board of Trustees voted in April 2017 to extend Drake’s contract until June 30, 2021 — a two-year extension of his original five-year agreement. Drake is an alumnus of Stanford University (BA) and the University of California, San Francisco (MD) as well as an elected member of both the National Academy of Medicine and the American Academy of Arts & Sciences. A board member of the Rock & Roll Hall of Fame and Museum, Inc., Drake annually teaches an undergraduate course on music, civil rights and the Supreme Court. His previous leadership roles with APLU include chair of the Council of Presidents and chair-elect of the Board of Directors. As board chair, he succeeds Robert Caret, chancellor of the University System of Maryland. APLU is a research, policy and advocacy organization dedicated to strengthening and advancing the work of public universities in the U.S., Canada and Mexico. With a membership of public research universities, land-grant institutions, state university systems and affiliated organizations, APLU’s agenda is built on the three pillars of increasing degree completion and academic success, advancing scientific research and expanding engagement. Annually, member campuses enroll 4.8 million undergraduates and 1.3 million graduate students, award 1.3 million degrees, employ 1.3 million faculty and staff, and conduct $44.9 billion in university-based research.